The Cocoweb ArmBar is getting some fantastic customer reviews and has some very impressive specs for a lock at this price. The marketing for the Armbar very much sets itself against the Kryptonite Kryptolok Series 2, claiming that it beats the more expensive lock on all counts. In this Cocoweb ArmBar review I will look at how secure it is, how easy it is to easy to carry around and use and possible alternatives. The ArmBar has a 14 mm thick heated alloy steel shackle, which is 1 mm thicker than both the Kryptonite Kryptolok Series 2 and the OnGuard Bulldog. The anti-theft mechanism incorporates a disc cylinder system which uses flat keys just like the Series 2 and the Bulldog. Unfortunately neither Sold Secure nor ART provide a security rating for the Armbar. It is certified by SBSC, the Swedish Fire and Safety testing body. However, what level of certification they give it and how rigorous the testing, is not clear. The ArmBar also comes with a 5 ft long, 12 mm thick, braided steel cable. While this cable is both longer and thicker than those come with the Series 2 and the Bulldog, in practice it offers very little extra protection as all cables can be snipped through in seconds. At 3.2 lb (1.45 kg) the Armbar is one of the heaviest budget 9 inch U-locks available. While this is undoubtedly a sign of high security, it also makes it difficult to carry around in a bag. Luckily, the ArmBar comes with a robust plastic frame mount that is considered one of the best around. The mount can be adjusted to fit a wide range of frame sizes and is PVC coated so it won’t damage your paintwork. Whats more, unlike the frame mount that comes with the Kryptolock Series 2, it is easy to install, easy to use and holds the lock firmly as you ride. Although it lacks the “bent foot” of the Kryptolock Series 2, the shackle attaches to the crossbar easily enough and the locking mechanism feels reliable. There is a sliding dust cover over the key hole that will protect it from the worst of the weather and reduce the chances of the mechanism stiffening up. However, bear in mind that the discs in the cylinder can become misaligned and water can freeze inside the lock. To avoid this happening you should never start to turn the key before it is fully inserted in the lock and should regularly clean and lubricate the mechanism. You only get 2 keys with the ArmBar and if you loose them you’re in trouble. 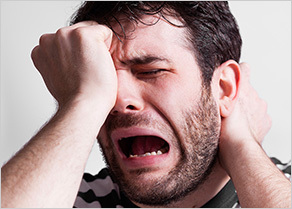 Unlike Kryptonite and OnGuard, Cocoweb do not offer a key replacement service. So don’t loose them! And unlike Kryptonite, they will not help if your keys get stuck in your lock. Like it’s rivals, the ArmBar comes with a braided steel cable which you can thread through your wheels or seat rails to provide additional security. The one that comes with the ArmBar is slightly thicker than those that come with the Krptolock Series 2 or the Bulldog. It isn’t quite as stiff either so it’s slightly easier to thread through your wheels. However, threading it in and out is still a hassle and its a pain to carry. And what’s more, the extra thickness offers negligible extra protection. So why bother? 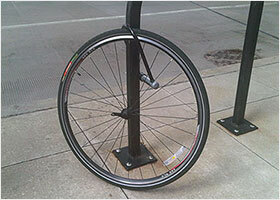 There are better ways to protect your wheels and you can buy this lock without the cable. You get a one year manufacturers warranty with the ArmBar. And that is it. Unlike Kryptonite or OnGuard, there’s no anti-theft programme. 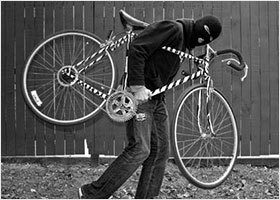 If your lock is broken and your bike gets stolen, you’re on your own. Now some might say that the conditions that Kryptonite and OnGuard impose in their anti-theft programs make it almost impossible to make a successful claim anyway. And of course they’re not free. But bear in mind that this lock has no Sold Secure rating either, which in the UK at least is usually a stipulation for insuring your bike. The ArmBar from Cococweb is a beast of U-lock. A big, heavy, no frills beast at a budget price. Don’t expect any after sale customer service with this lock because you won’t get any. If you loose your keys or your keys get stuck in the lock, you won’t get any help. However, with a 14 mm shackle that should defeat all but the biggest bolt cutters and a robust, easy to use frame mount, there’s a lot to like about this lock. It’s not going to foil a serious thief. 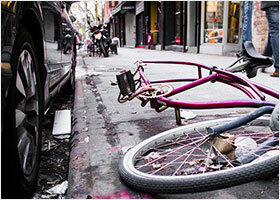 But it will certainly beat the opportunists that make up the vast majority of the bike thieves prowling the streets. If price is your main concern and the weight is no concern then this could be the best bike lock for you! The OnGuard Pitbull also has a 14 mm shackle. But it locks in 4 places rather than 1. So while the Armbar can be pulled apart after just one cut, a thief would need to cut the Pitbull twice to defeat it. This means it’s more secure and Sold Secure give it a Gold rating. It’s slightly heavier and more expensive than the Armbar. But OnGuard locks are still fantastic value for money and don’t forget you get a replacement key programme as well. So if you’re looking for a lock that’s the same size as the Armbar but that offers a higher level of protection and good after sales service at a fantastic price, this is a great choice. The Bulldog DT from OnGuard is 25% lighter than the Armbar. 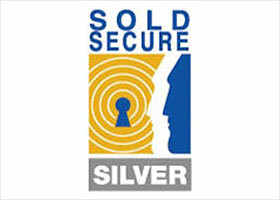 However it still has a Sold Secure Silver security rating. And you get a reasonable level of after sale customer support. The frame mount is not quite as good as the ArmBars though. Check out our full review of the OnGuard Bulldog DT. You can also compare the specs to loads of other U-locks. Looking for a better pedigree? 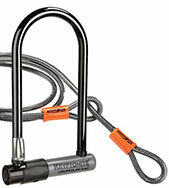 The Kryptolok Series 2 from Kryptonite is the classic U-lock. You know you’ll get a good quality, long lasting lock with solid security ratings that include Sold Secure Silver and 2/5 from ART. And the after sale customer service is also unrivaled. Have a look at our full review of the Kryptolok Series 2. 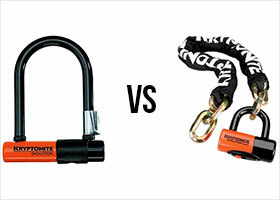 And see how it compares to loads of other U-locks. Still not sure? 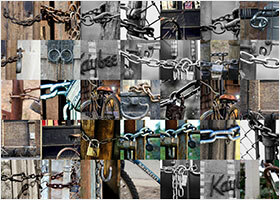 No worries, my simple 3 step guide will show you how to pick the right lock for you and your bike!